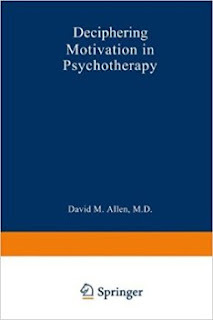 My second book, "Deciphering Motivation in Psychotherapy" was reissued a while back after going out of print, but was priced in the stratosphere. It's now available on Amazon for a more reasonable price at https://www.amazon.com/Deciphering-Motivation-Psychotherapy-Critical-Psychiatry/dp/0306437902/ref=mt_hardcover?_encoding=UTF8&me=The book covers the often covert nature of interpersonal communications within dysfunctional families, and helps both therapists and lay readers learn how to dig out hidden meanings in their verbal interactions. The hidden meanings, in turn, reveal the ulterior motives and underlying internal conflicts of the involved family members. The book also clarifies the concept of dialectics in a way that I think is way more accurate that the way the concept is used in Dialectical Behavior Therapy (DBT).